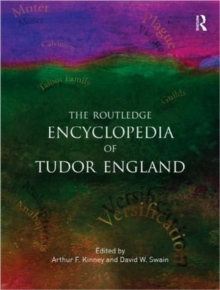 The Routledge Encyclopedia of Tudor England is the first encyclopedia devoted entirely to the study of the Tudor period. Previously published as Tudor England: An Encylopedia, this hugely useful reference work is now available in paperback for the first time. England under the Tudors moved from a monarchy threatened by pretenders, through the strong rule of Henry VIII, to a time when Elizabeth I's advisors implored her to marry to protect the Tudor succesion. For the first time the vitality of the period and its people, and the rich backdrop for a century of rules, thinkers, and writers -"the Age of Shakespeare"- is captured in a comprehensive encyclopedia. The volume includes:*Over 700 entries *over 240 contributors *Over 100 illustrations *Detailed Tudor chronology *Appendix of bibliographical essays*An 8-page color insert. Offering a thorough survey that will be invaluable for students and specialists alike, this volume also provides detailed context for English Renaissance and Shakespearean studies.